Our K2/Spice on-site test is the most sensitive K2 screen on the market, with the lowest cut-off level 25 ng/ml for synthetic cannabis, compounds used in the majority of K2 products. 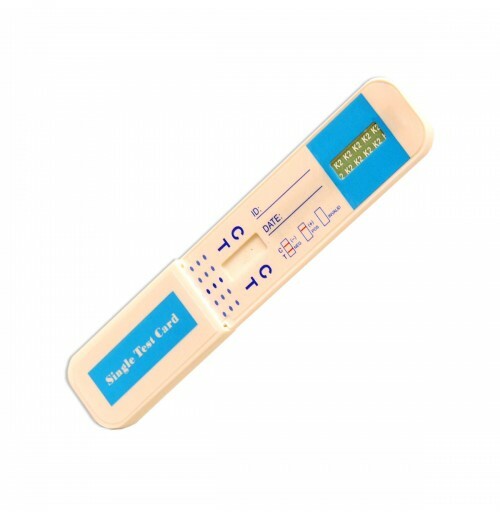 This urine drug testing also makes an efficient solution for screening employees, kids and teenagers as part of preventive measures in maintaining drug-free environment in the workplace, universities, schools, and other institutions. Immerse the absorbent tip into the urine sample for 5 seconds. Urine sample should not touch the plastic device. Replace the cap over the absorbent tip and lay the device flat on a clean, non-absorbent surface. NEGATIVE: Two lines appear. One color line should be in the control region (C), and another color line should be in the test region (T). This result indicates that the drug concentration is below the detectable level. NOTE: The shade of color in the test line region (T) will vary, but it should be considered negative whenever there is even a faint distinguishable color line. POSITIVE: One color line appears in the control region (C). No line appears in the test region (T). This result indicates that the drug concentration is above the detectable level. INVALID: Control line fails to appear. Insufficient specimen volume or incorrect collection are the most likely reasons for control line failure. The cut-off level of this urine testing kit is 20ng/mL. It provides only a qualitative, preliminary analytical result. To obtain a confirmed result, a secondary analytical method must be used, such as the Gas chromatography/mass spectrometry (GC/MS). Make sure to read the package insert for further details on the limitations of the test. JWH-018 are JWH-073 are synthetic cannabinoids sprayed in over a dozen “herbal incense” products, such as K2, Spice, Pep Spice, Spice Silver, Spice Gold, Spice Diamond, Black Mamba, Buzz, Voodoo, Chill X, Algerian Blend, Dragon’s Slice, Tropical Synergy, Spice 99, Mojo, Pot-pourri, Pulse, Hush, Earthquake, Blaze, Red X, and Dawn. They mimic the effects of THC, the primary active ingredients of cannabis. Other synthetic cannabinoids that are believed to be present in these products are JWH-015, JWH-019, JWH-081, JWH-200, JWH-250, HU-210 and HU-211.